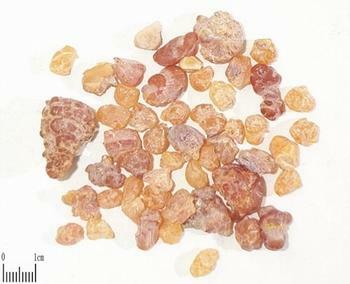 The exudation of resin from skin areas of tree Boswellia carterii Birdw of family Bruseraceae and plants of the same family. Somalia and Ethiopia in Africa. Fragrant smell and light bitter taste. Light yellow, granule-like, translucent, purified, fragrant. Pungent, bitter, warm; liver, heart and spleen meridians entered. Activate blood, move qi and alleviate pain, resolve swelling and promote tissue regeneration. This herb can disperse and dredge qi and blood of Zang and Fu organs internally, penetrate and reach meridians and collaterals externally serving as a miraculous herb with actions of activating blood and alleviating pain. So it is indicated for all kinds of syndromes of qi stagnation and blood stasis such as chest pain, hypochondric pain, heart and abdomen pain, dysmenorrhea, postpartum abdominal pain, wind-damp arthralgia and mass. It is always reinforced by the combination with Mo Yao. For angina pectoris, it is combined with blood-activating and qi-moving analgesics such as Dan Shen and Chuan Xiong, etc. For chest and abdomen pain or stomachache due to qi and blood stagnation and stasis, it is combined with qi-moving and blood-activating analgesics such as Chuan Lian Zi, Mu Xiang and Yan Hu Suo, etc. For dysmenorrhea, amenorrhea and postpartum abdominal stagnant pain, it is combined with blood-activating and stasis-resolving herbs, and meridian-unblocking analgesics such as Dang Gui, Dan Shen and Mo Yao, etc. in Huo Luo Xiao Ling Dan from Yi Xue Zhong Zhong Can Xi Lu. For wind-cold-damp arthralgia and numbness and pain of limbs, it is usually combined with wind-damp-dispelling herbs and arthralgia-relieving herbs. For instance, it is combined with Qiang Huo, Fang Feng and Qin Jiao in Juan Bi Tang from Yi Xue Xin Wu. This herb not only activates blood and alleviates pain but also resolves and dispels carbuncle and swelling, promotes tissue regeneration and heals wound. It is used both internally and externally as a key herb in department of traumatology. It is commonly indicated for traumatic injuries, swollen and pain due to stasis, the beginning stage of sore, abscess, carbuncle and swelling manifested by red, swollen, hot sensation and pain, ulcerated sore and abscess but not healed for a long rime and so on. For traumatic injuries and swollen and pain due to stasis, it is usually combined with blood-activating analgesics. For instance it is combined with Mo Yao, Xue Jie and Hong Hua, etc. in Qi Li San from Liang Fang Ji Ye (Collections of Useful Prescriptions). For the beginning of sore and abscess, it is combined with heat-clearing and toxicity-relieving herbs and carbuncle-resolving and nodulation-dissipating herbs. For instance it is combined with Mo Yao, Jin Yin Hua and Bai Zhi in Xian Fang Huo Ming Yin from Jiao Zhu Fu Ren Liang Fang. For ulcerated sore and abscess not healed for a long time, it is used to promote tissue regeneration and heal wound. For instance it is made powder with Mo Yao in Hai Fu San from Chuang Yang Jing Yan Quan Shu. For abscess and deep rooted carbuncle, phlegm nodule with hard and firm lumps, it is combined with Mo Yao, She Xiang and Xiong Huang to relieve toxicity, resolve abscess and dissipate nodulation in Xing Xiao Wan from Wai Ke Quan Sheng Ji. Decoct 3~10 g. It should be stir-baked until the oil removed. Proper dose is for external application. Unprocessed or stir-baked and made powder for external application. This herb is drasticly pungent with strong stimulation to stomach and easily causes nausea and vomiting. So it should not be taken by large dose or for a long time. Use with cautions for patients with weak stomach; prohibited for pregnant women.